Clone Wars vs. The Expanded Universe? The Star Wars Clone Wars cartoon series represents a dramatic shift in the way that the Star Wars universe expanded. Clone Wars set the standard, for better or worse, for the way we would enjoy Star Wars outside of a movie theater. But should that be celebrated or bemoaned? 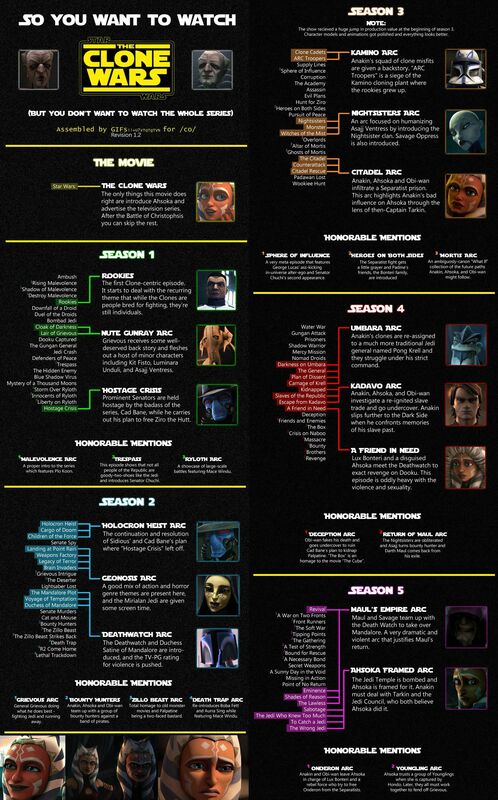 To get to a real understanding of the Clone Wars, you have to start with the Expanded Universe. The previous, now defunct, “Legends has it” Expanded Universe built its array of stories and tales on the backs of a few different media: novels, video games, and the Collectible Card Game by Decipher. And, yes, while there were many other elements out there, from comic books and trading cards to role playing games and Star Wars-themed Pepsi products, the aforementioned three main media drove the development of the Expanded Universe more than any other. The novels set out the grand storyline that continued to follow the Rebel Alliance after the Battle of Endor. It included the marriage of Han and Leia Solo and their resultant children, the birth of the New Republic, the development of the New Jedi Order under Grand Master Luke Skywalker and his newly trained Jedi Knights, and the devolution of the Imperial Remnant from galactic powerhouse to relegated government. Things got complicated fast as authors were pressed for content without the steady and guiding hand of an overarching story team. No one knew what to do (with some exceptions, mainly the exemplary Timothy Zahn) because there was no plan. The introduction of the New Jedi Order series helped focus everyone’s efforts into the new war with the extra-galactic invaders, the Yuuzhan Vong. A lesson was learned: having a focused story arc leads to greater success in storytelling. The Yuuzhan Vong brought a new element to Star Wars, and offered important lessons to the storytellers of the future. The video games of the old EU covered all sorts of ground. The Episode 1 Podracer game brought the entertainment of the in-universe characters to the bizarrely-designed N64 controllers in living rooms across the country. The Battlefront series took the large-scale combat skirmishes of the films into our home as well. The Dark Forces games helped explore what happens when an average citizen of the galaxy discovers he has Force powers. A second lesson was learned: there’s more going on in the universe than just the Skywalker saga. Lastly, Decipher’s Collectible Card Game (CCG). If you missed out playing this game, you missed out sorely. For several years, the Star Wars CCG was the only game to rival the father of all CCG’s, Magic:The Gathering. It placed as the second most popular CCG by sales volume until the juggernaut Pokemon hit our shores. However, gaming fans and Star Wars fans (and the large swath of overlap in that imaginary Venn diagram) continued to support the game until Decipher lost the license to (who else?) Wizards of the Coast, the makers of both Magic and the Pokemon CCG. But, in the time when the Star Wars CCG was still going strong, it helped provide so much of the context that would shape fans’ understanding of the Star Wars universe. It showcased all sorts of B and C level cast from the movies, provided definitive rankings of power and ability (useful for the “who would win in a fight” schoolyard conversations), and even helped bring visual imagery to the worlds created by the novels. For example, the character of Mara Jade had a face because of the CCG. Decipher auditioned and hired Shannon McRandle and designed the card images for Mara Jade on her. Many other characters who had not yet been given screen time would receive de facto canon artwork and some even action figures because of the CCG, including Corran Horn, Mirax Terrik, and others. Yes, these characters might have also existed in the comics and some other sources, but they had no other photo-realistic depictions until Decipher made a card for them. A third lesson was learned: these new characters mattered, and deserved to be placed in the conversation along with the films’ other heroes. So what does this have to do with the Clone Wars? We know that George Lucas always had his hopes of moving Star Wars to the small screen. We have all read the stories about the hundreds of hours of developed material for Rick McCallum’s Star Wars:Underworld which even still has an iMDB page (slated release of 2018, or never, whichever). But Clone Wars was the one that made the jump: an animated, half hour show, with a target demographic of 8-13 year old boys. And when the fandom heard about the target demographic and expected direction the show would take, it was as if millions of nerd cried out in terror and were suddenly silenced…. This was not what we wanted. We did not want the Powerpuff Girls with Jedi. We did not want Johnny Bravo in our Star Wars. No. No, no no no no NO, NO NO. Cartoon Network first gave us Genndy Tartakovsky’s 2D Clone Wars micro-series, which, albeit imperfect, was a triumph in many ways. We thought maybe that would be what the regular Clone Wars show would become, but we were all of us… deceived. So I refused to watch it. Would not do it. Not interested. But after a while, I noticed it was gaining traction amongst fans like myself. It was available on Netflix, which made it convenient. They were bringing in interesting characters, which made it appealing. Darth Maul was back, which made it exciting. Little signs like this continued to pop up on my radar, and then when the Disney acquisition occurred and Disney took an atomic bomb to the EU, it was the only thing left. So I had to give it a try. But had Clone Wars learned the lessons that the EU was trying to teach? Could it expand the scope of the story from the Skywalker family and friends to truly encompass the galaxy? Would there be consistent storytelling and arcs within the series? And would the new additions, presuming that there would be additions to the Star Wars universe, be of enough quality to make a difference? The new characters of the series offered something special… but was it enough? From the bottom, we can start most positively. The Clone Wars brought us some excellent additions to the Star Wars universe and made some of the peripheral characters more interesting than the main characters. Ahsoka Tano proved to be a valuable addition to the canon, although not until later seasons. Her earlier seasons reminded me of Link from the 1980’s animated Legend of Zelda cartoon. I expected her to exclaim, “Well excu~uu~use me, Master!” But her character jumped to the forefront around Season 3. By the end of Season 5, she had become her own force, capable of carrying story arcs, and earned the vested emotion that the audience felt. Ahsoka had become more than just the little sister to the main hero because she had owned her character. She took responsibility for clones under her command, developed an appreciation for life outside of the Jedi Order when she connected on an emotional level to friends on Onderon, and lastly she saw through some of the failing veneer of the Jedi Order when it (**SERIES FINALE SPOILER**) accused her of the terrorist assault on the Temple and her subsequent departure from the Order. In the end, Ahsoka grows on you and becomes worth the time. Besides Ahsoka, several of the other characters introduced in the show are also worth keeping and revisiting in the Star Wars universe. Cad Bane deserves more written about him, as do the Deathwatch (and all of Mandalore, really), as well as Darth Maul. These three entities were probably the highlight additions (besides Ahsoka). I am including Darth Maul here because that is where he came alive (pun completely intended) as a character. His mess in Phantom Menace doesn’t, doesn’t count. Let’s talk about storytelling, then. Because Clone Wars gives us both the highs and lows. While there are many ingredients that go into the pot of good storytelling, surely we can agree that clear story arcs that continue over a number of entries in series results in higher quality than those entries with no story arc. While it is not a guarantee of success, we can see that success is not possible without it. This was part of what the old Expanded Universe taught us: when things are connected, they get better. But then there is the question about the Skywalker saga and whether Clone Wars expands past this family for a wider lens’ focus on the rest of the galaxy. If you consider the Skywalker family to include Anakin, Padme, and Obi-Wan, and even Ahsoka as surrogate sister, then no there is little exploration into the galaxy without them. Some of the other Jedi make interesting additions but there is no reliance on any of those characters in propelling the overall narrative. The New Jedi Order series had major consequences for every character involved, and even relied on those second tier characters for the survival of the top tier characters. While Luke, Han, and Leia are certainly important to the narrative (and the survival of the New Republic), our hearts went out to Wedge Antilles, Anakin Solo, Jacen and Jaina Solo, Vergere, Borsk Fey’lya (for crying out loud! ), and so many others because of how important they were inside the story. Even the Yuuzhan Vong and the Imperial Remnant had their own heroes and villains, which created a depth of story beyond anything else with the Star Wars label on it. Here, it is so overwhelmingly focused on Anakin and crew, that the show starts to feel empty, as if there really are not other characters out there. It seems everyone is always focused on Anakin. So when the Clone Wars relied so heavily on a relatively small band of heroes, it felt too small. It felt too convenient, as if they were truly the only ones having adventures. The Separatist movement had very little development outside of Asajj Ventress and her relationship with Count Dooku. The lens of The Clone Wars is so narrow as to be exclusive of the rest of the conflict and strife rampant throughout the galaxy. If the creators had lifted their eyes from the Skywalker family, we could have seen so much more around us. Perhaps The Clone Wars did not learn all the lessons that the Expanded Universe offered. But, those lessons that it did learn, it took to heart. There are parts of The Clone Wars series as a whole that are undeniably fantastic additions to the Star Wars mythology. But for every positive entry, we must seem to endure two sub-standard ones. But perhaps this is more subjective from my particular viewpoint. I do not fit squarely into the target demographic that the creators of this show were aiming for. Perhaps I need to realize that this particular branch off of the Star Wars tree was not for me. Maybe we all need to remember the lessons from the Expanded Universe and apply them to ourselves. Look beyond yourself to see what story is being told around you. Go out there with planning and focus in order to achieve your goals. And don’t forget that, while you might be the main character in your story, you may need to focus on your supporting cast.